DEE DEE KING LIMITED EDITION LP VINYL REISSUE OUT NOW! You asked for it Cretins—and here it is! 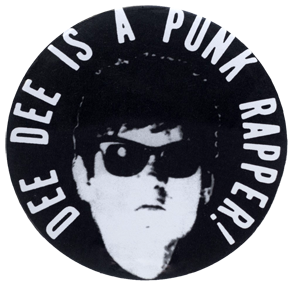 Dee Dee Ramone's rare solo album released under his 'rap/hip hop' alias "Dee Dee King" returns! Dee Dee's unique punk/rap/hip-hop creation is "like nothing you've ever heard before" and available now for the first time on vinyl since its long sold-out original pressing in 1989! Features guest appearances by Blondie's Debbie Harry and Chris Stein. Also includes the original version of "The Crusher" with Dee Dee on lead vocals, (a song later recorded by the Ramones for their final studio album, 1995's "Adios Amigos"). New reissue packaging includes a Japanese-style obi strip. LP Limited to 3,000 units pressed on Black 150 gram vinyl. 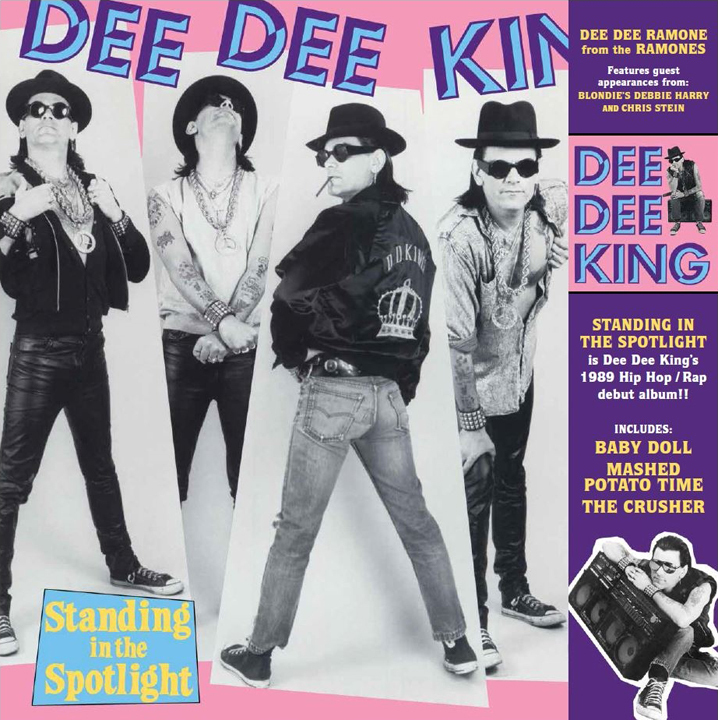 Order worldwide directly from the Dee Dee Ramone Online Shop or look for Dee Dee King "Standing in the Spotlight" available now in record stores throughout North America—while supplies last. 2.) "2 Much 2 Drink"
4.) "Poor Little Rich Girl"
5.) "Commotion In The Ocean"
10.) "I Want What I Want When I Want It"
Click Here to read in an in-depth interview published online by CLRVYNT and learn more about the history of Dee Dee's unique album, directly from its producer Daniel Rey. 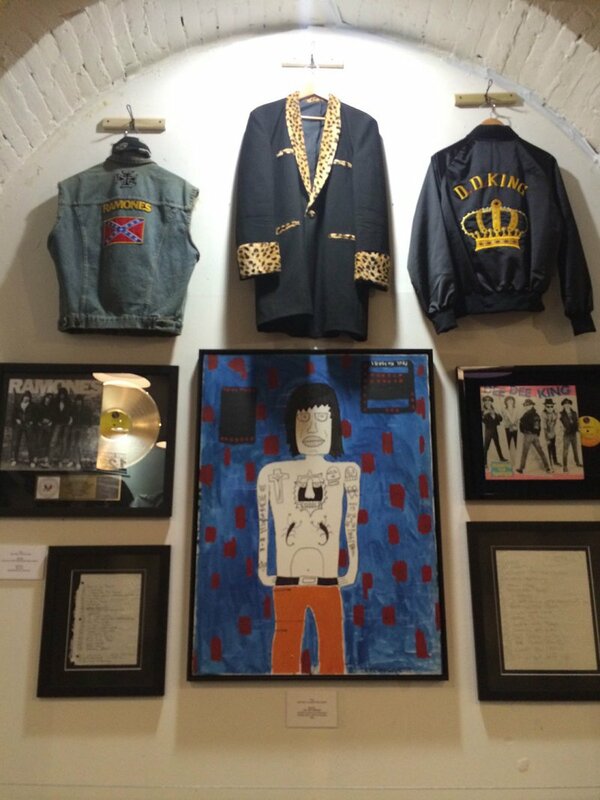 The original embroidered Dee Dee King jacket worn by Dee Dee himself on the cover of the album (pictured above) was exhibited along with other rare artifacts in Dee Dee Ramone: The Exhibition NYC which opened at the Hotel Chelsea Storefront Gallery on December 10, 2014 through January 4, 2015. In addition to being a founder member, primary songwriter and bassist in the Ramones, Dee Dee Ramone was a creative force whose work knew no boundaries. Extending his hand to literature, the enigmatic Ramone transcribed the turbulent life of a punk rocker through his self-written books. 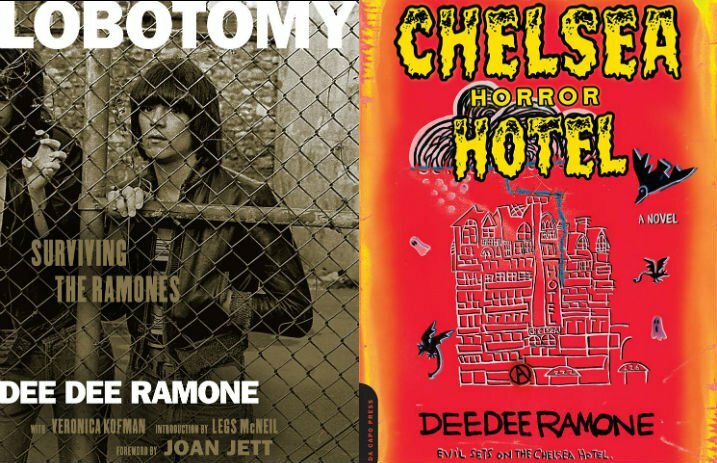 Now, Da Capo Press is releasing special editions of two of Dee Dee's books: “Chelsea Horror Hotel” and “Lobotomy: Surviving the Ramones.” Both feature new covers and all-new forewords written by fellow Rock 'n' Roll Hall of Famer Joan Jett (for "Lobotomy") and horror icon Joe Dante: Director of Gremlins, The Howling and Twilight Zone the Movie, (for "Chelsea Horror Hotel"). The official release date is March 1, and coincides with the 40th anniversary of the Ramones' groundbreaking debut album. There are LOTS more great details on these special new editions to speak of so CLICK HERE (or the Alt Press logo below), to read the full story reported by Alternative Press. 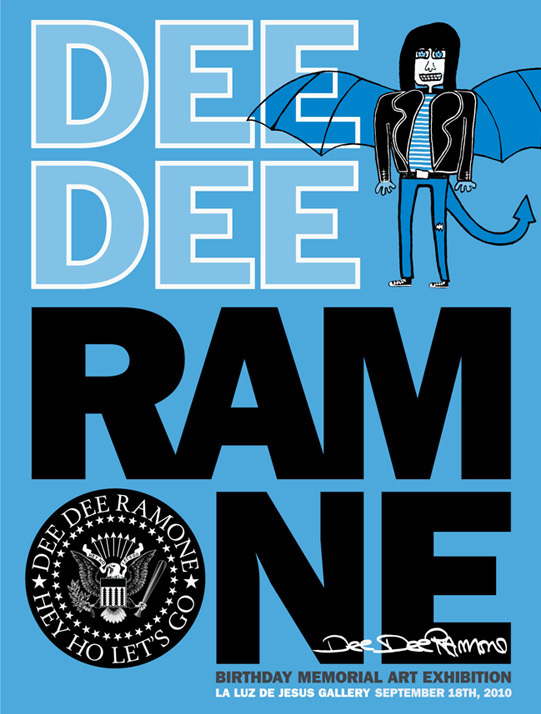 The books can be ordered directly from the Dee Dee Ramone Online Shop or found in stores and online nationwide. Both titles also are available now for the first time in digital eBook form on iTunes, Amazon, Google Play, Barnes & Noble's Nook Store and more. 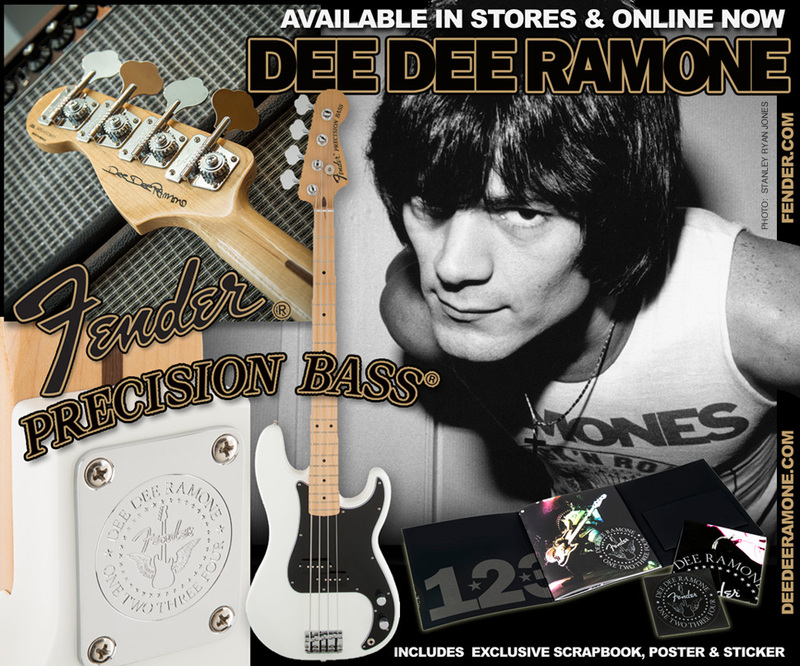 OFFICIAL DEE DEE RAMONE LTD ED ARTIST SIGNATURE FENDER PRECISION BASS AVAILABLE NOW! As the pounding heart of the Ramones, Dee Dee pioneered a no-frills sound and style that left a permanent mark on rock music. On a white Fender Precision Bass slung impossibly low, he defined punk bass with simple but breakneck bass lines delivered with such pulverizing sound, speed and conviction that he singlehandedly set the template for generations of punk bassists to come. The Dee Dee Ramone Precision Bass honors him with reverence and authenticity, just like any bassist since who's ever planted his feet in a wide stance, slung a Precision below the beltline and yelled a manic "1-2-3-4" count-off. The official Dee Dee Ramone Fender Precision Bass features the classic Fender body, vintage style bridge, maple neck with "C" profile and the vintage-style frets used by Dee Dee when making history and changing the face of rock 'n' roll. The incredible Ltd Ed piece also features Dee Dee's facsimile signature on the headstock, a custom engraved Dee Dee Ramone/Fender logo neck plate, plus an exclusive scrapbook, fold out poster and sticker too! Visit Fender.com for more details, photos, full specs, or to order online now. 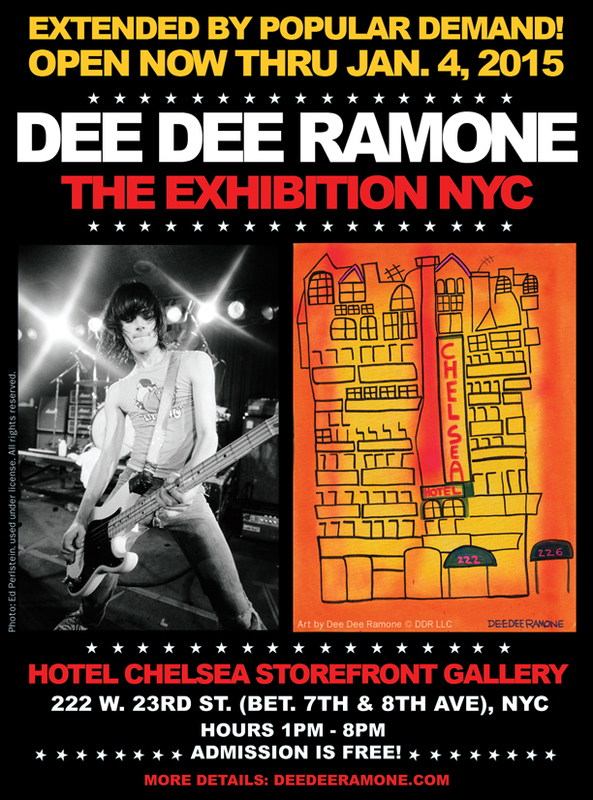 The Dee Dee Ramone Exhibition is NOW OPEN in Dee Dee's home turf of NYC for the first time ever at the Hotel Chelsea Storefront Gallery (222 West 23rd Street), from December 10th, 2014 - January 4th, 2015. The launch of this exhibit offers a preview of the soon-to-be-released Fender® Dee Dee Ramone Limited Edition Signature Precision Bass® guitar, a tool used by the enigmatic Ramone to leave his indelible fingerprint on rock history for generations to come. 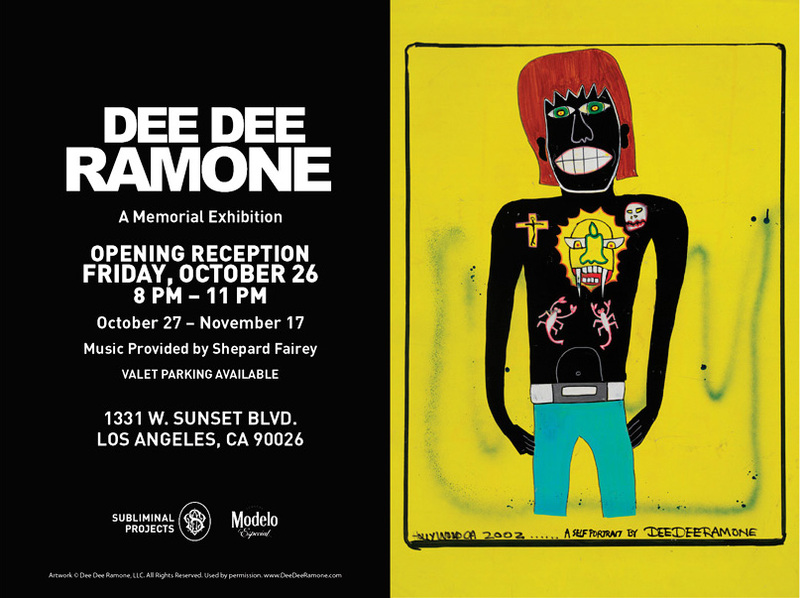 This historic exhibition sanctioned by the rock legends' own estate, celebrates all of the facets of Dee Dee's long-lasting artistic legacy: a founding member of the Ramones, one of the most influential punk-rock bassists and primary, prolific songwriter of world famous group, as well as his work in the visual arts - proving that Dee Dee, who began painting more seriously in 1996, was an artist in every sense of the word. The breadth of Dee Dee's art and achievements is so wide that one of his paintings, to be featured in the exhibit, was recently showcased in a question on America's favorite quiz show Jeopardy. Additionally, what makes this exhibition so incredibly unique is Dee Dee's history with the iconic Hotel Chelsea, which is not only a place he frequented, and at times lived in, but was also the setting for his 2001 novel Chelsea Horror Hotel: A Novel, as well as the focus of many works of art now on display in the exhibition. The legendary Hotel Chelsea has been home to generations of writers, artists, musicians, and bohemians and Chelsea Hotels is continuing the dedication to its history and support of the arts through this exhibition. 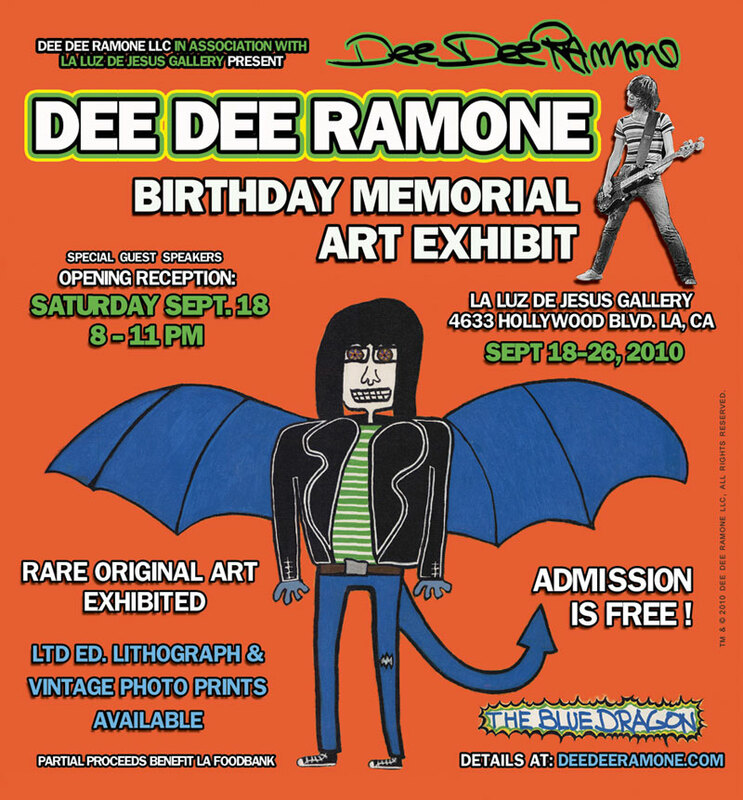 In addition to featuring Dee Dee's original art, wardrobe, memorabilia and rare artifacts, the Dee Dee Ramone exhibition also includes iconic photographs by world famous photographers including Bob Gruen, Mick Rock, Chris Stein (Blondie), Ed Perlstein, Stephanie Chernikowski, Keith Green, Jenny Lens, Stanley Ryan Jones, Jimmy Steinfeldt and more. Previous exhibits of Dee Dee's work have been held at La Luz De Jesus and famed street artist Shepard Fairey's Subliminal Projects galleries in Los Angeles, and is now being presented in New York for the first time. The exhibition is open to the public from 1pm to 8pm every day, 7 days a week, starting Dec. 10, 2014 thru Jan. 4th, 2015. ADMISSION IS FREE! CRETINS, PINHEADS AND WARTHOGS, MARK YOUR CALENDARS—YOU WILL NOT WANT NOT MISS THIS EVENT!! Check back here for more details as they become announced on both the Exhibition, and the Fender Dee Dee Ramone Artist Signature Precision Bass. CLICK HERE for your chance to win the upcoming Bass FREE from Amoeba & Truetone Music! While 'Saint Nick' brings toys to all the 'good' boys and girls one night a year, Saint Dee Dee watches over you and protects against mediocrity in music and art all year round! This deluxe Ltd Ed Ornament features full color St. Dee Dee artwork on rich royal blue glass with gold glitter highlights on the front. Gold stars with "Highest Trails Above"—the phrase etched in Dee Dee's gravestone—screen printed on the back. 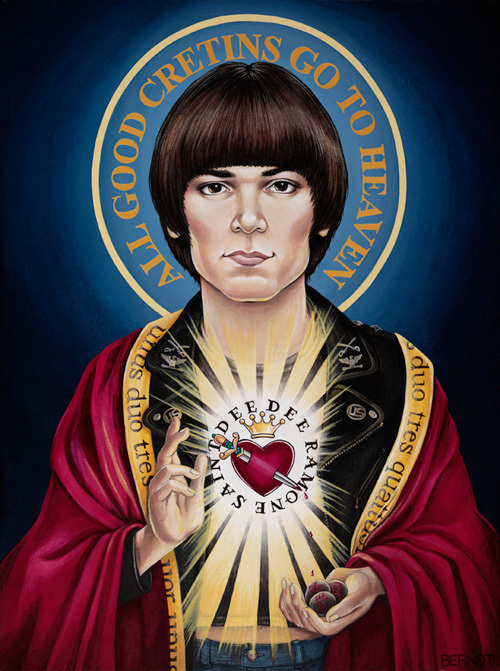 See the original Saint Dee Dee painting (by artist Vicki Berndt) on display and pick up one of the ornaments (while supplies last) at Dee Dee Ramone The Exhibition NYC from Dec 10, 2014 - Jan 1, 2015 at the Hotel Chelsea Storefront Gallery @ 222 W. 23rd St. NY, NY—OR can't make it to NYC?...Click below to visit the Dee Dee Ramone Online Shop and order one now while you still can—supplies are limited! DEE DEE RAMONE ON JEOPARDY! Attention all Cretins: Tune in to ‘America’s Favorite Quiz Show’—Jeopardy! with host Alex Trebek this Wed. Sept 24th for a clue featuring Dee Dee Ramone! The new episode will debut airing in primetime on the East and West Coast at 7pm as part of Jeopardy!’s 31st season (2014-2015). Check your local listings for specific station and airtime in your area or click here for an interactive map on the official Jeopardy! website that provides station information by state. 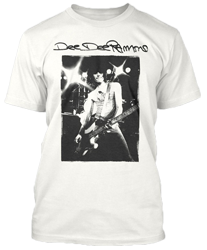 Dee Dee Ramone Online Shop. 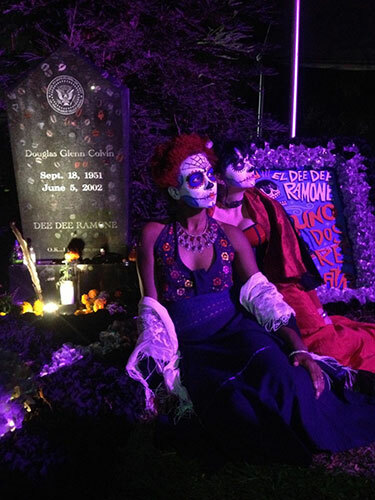 Cretins pay their respects at Dee Dee's gravesite (Hollywood Forever Cemetery in Los Angeles, CA), during Dia De Los Muertos 2013 (Photo: Barbara Ramone Zampini). "El Dee Dee" artwork by Carlos Hernandez. 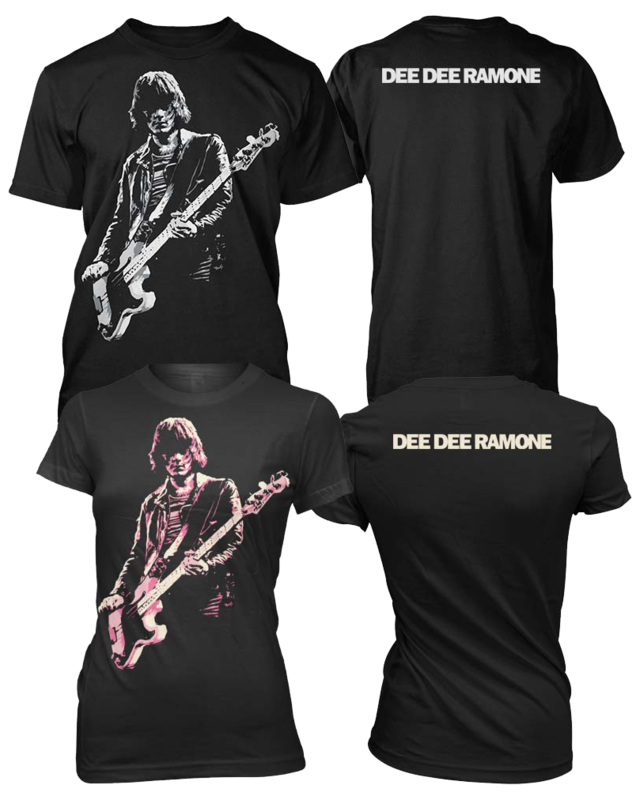 "El Dee Dee" T-shirts and other great stuff available now at the Dee Dee Ramone Online Shop. In honor of the legendary Dee Dee Ramone’s birthday (Sept. 18th), we’re offering cretins an ultra limited edition HAND SILK-SCREENED print, available in your choice of two color-ways, PLUS matching Ltd Ed. T-shirts too. 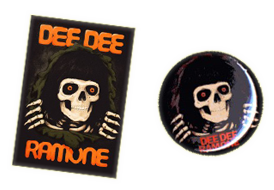 These items are super-rare and EXCLUSIVE to the Dee Dee Ramone Online Store. You won’t find these anywhere else—worldwide. The fine art print showcases a killer new illustration by artist Billy Perkins. Known for his ’77 print series (which featured Dee Dee along with other 70’s icons), you can also find Billy’s “Pulp Fiction” art gracing the cover of Gallery 1988’s Crazy4Cult movie art book. Billy’s work is also featured in the books Art Of Modern Rock, Gigposters: Rock Art of The 21st Century, Swag 2 and more. Each 18” x 24” print is full bleed meaning the entire print surface is screened with artwork from top to bottom—no border. 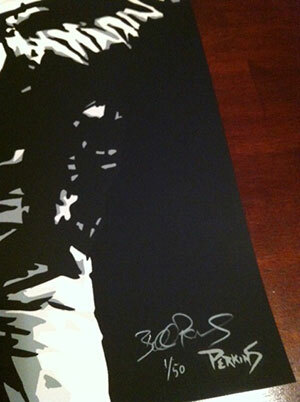 Each one has been painstakingly silk-screened BY HAND, then signed and individually numbered by the artist. PINK AND BLACK EDITION—LIMITED TO 100 PRINTS worldwide, on premium high grade cream colored paper stock. VARIANT GRAY/BLACK AND WHITE EDITION—LIMITED TO 50 PRINTS worldwide, on premium high grade white paper stock. Making this edition even cooler, in an effort to give all Dee Dee fans a fair shot at one of these fine art prints, they’ve been affordably priced—while they last—at only $30 each! OR buy the combo pack to get your print bundled with the matching Ltd. T-shirt and save $5.00! The T-shirts are available in both colorways: gray/black & white on a men’s unisex tee, and the pink & cream on black in a girl’s tee. Like the prints themselves, these Tees are premium and limited edition. 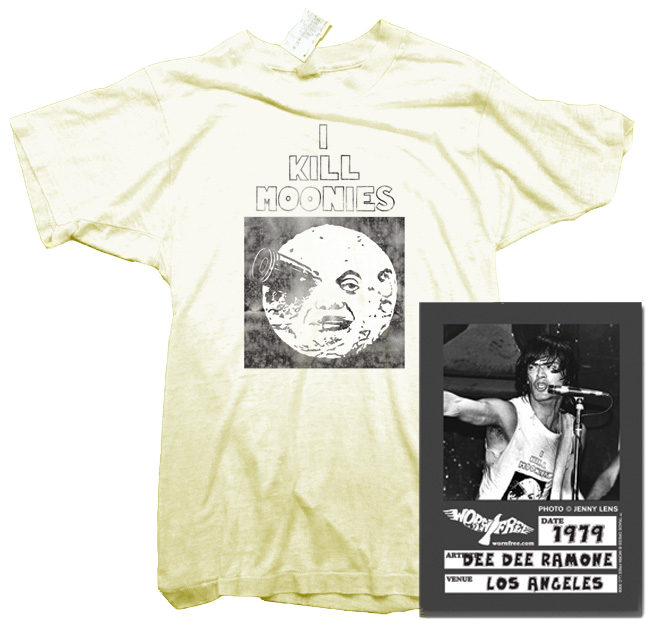 Each shirt includes a DEE DEE RAMONE back print (in matching color way) and are unavailable anywhere else. Represent. Net proceeds benefit Foodbank in Dee Dee's name. 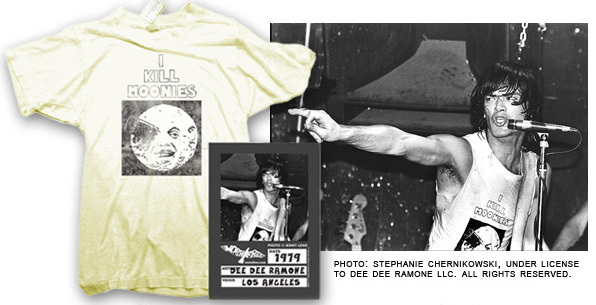 Celebrate the life & legacy of Dee Dee Ramone, get some great stuff, and help a worthy cause in the process. 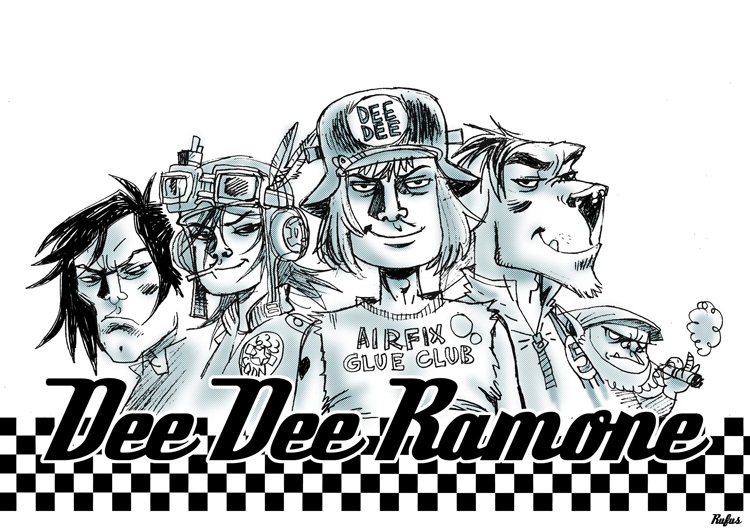 Stay tuned to DeeDeeRamone.com for more incredible news and announcements soon to come! "I was a teenager in the mid to late 70's when the punk rock movement was in full swing. In my small town in Central Texas, rock radio was nonexistent, so we relied on our friends and other kids to turn us on to new music. A small group of kids in school began to dress differently than the rest...holes in their jeans, Converse shoes, black leather jackets adorned with buttons, spiked hair styles and some guys with eye liner. A couple of them were good friends of mine, so my curiosity made me find out more. In my friend's room, we spun the first Ramones record. I had never heard anything like it and was drawn to it immediately (a favorite then and now was "Beat On The Brat"). I got my chance to see them live in 1980 on the End of The Century tour. At 17, I was still too young to get in to Austin's legendary venue, The Armadillo World Headquarters, so I snuck in. My friends and I stood right in front of Dee Dee for the entire show. It was a life-changer in ways that are hard to put into words. Dee Dee's feet rarely touched the ground, except to shout out a four count into the mic, and to kick my friend's hand hard for grabbing his leg (my friend has probably still not washed that hand). We left there a little buzzed and very stunned, not sure what we had just witnessed, but knowing that whatever it was, we liked it—a lot. It was spontaneous, rebellious and primal...rock music broken down into its most basic, undeniable hooks...short, punchy and very loud, and we were suddenly a part of it. 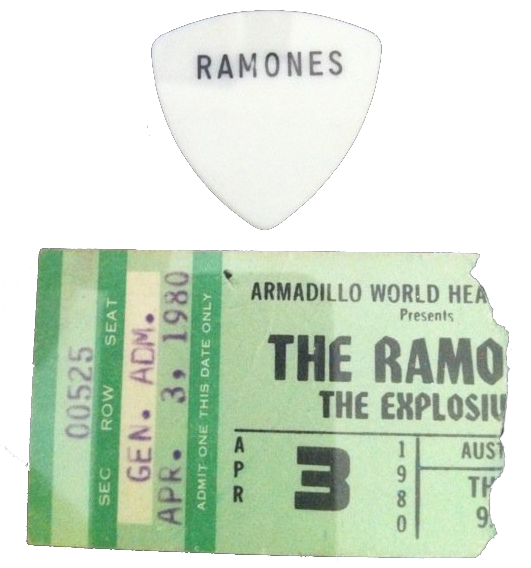 As the crowd dissipated and we wiped off our sweat, I realized that I had something in my hand: Dee Dee's bass pick. I must have caught it sometime during the show and palmed it in my fist. I've had it ever since, along with my stub from the show. That show was special. It changed me. 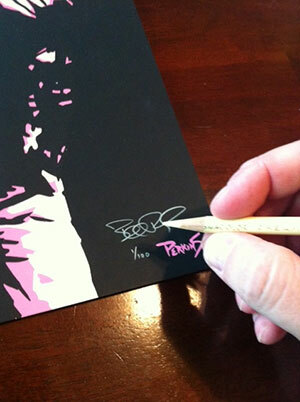 Thirty-three years later, I am still as excited as a teenager to be doing a print for Dee Dee. Hope you all enjoy it. It was designed by a fan." 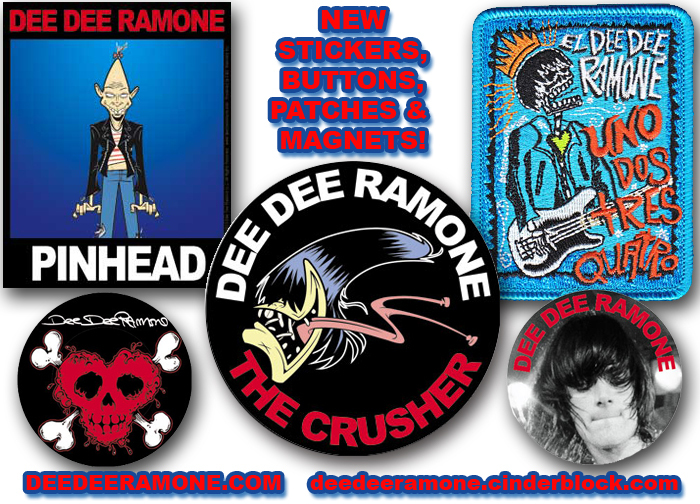 NEW DEE DEE RAMONE SKINS AND CASES BY ZING! Choose from FOUR different DEE DEE RAMONE skin designs to protect all of your electronic devices in style. Available now from Zing, the leader in music and pop culture removable eDevice skins. Make your stuff say you, phones, mp3 players, laptops & notebooks, tablets & eReaders, gaming, wall art—even skins for your credit cards—Zing skins integrate flawlessly. The easy on/off material prevents bubbles and provides a clean removal every time, allowing you to change skins as often as you’d like. Zing skins are made in the USA with ultra premium vinyl to protect your devices from scratches and sun damage. If hard cases are more your style, ZING has you covered there too. 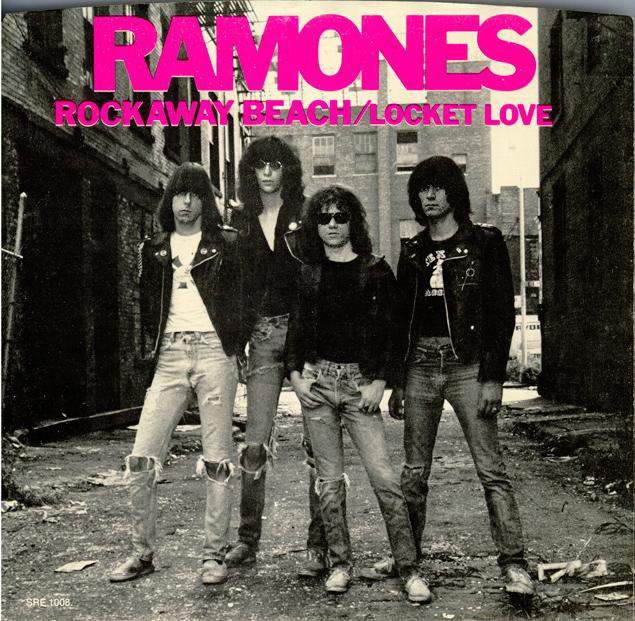 RAMONES TO HELP REVITALIZE ROCKAWAY BEACH! 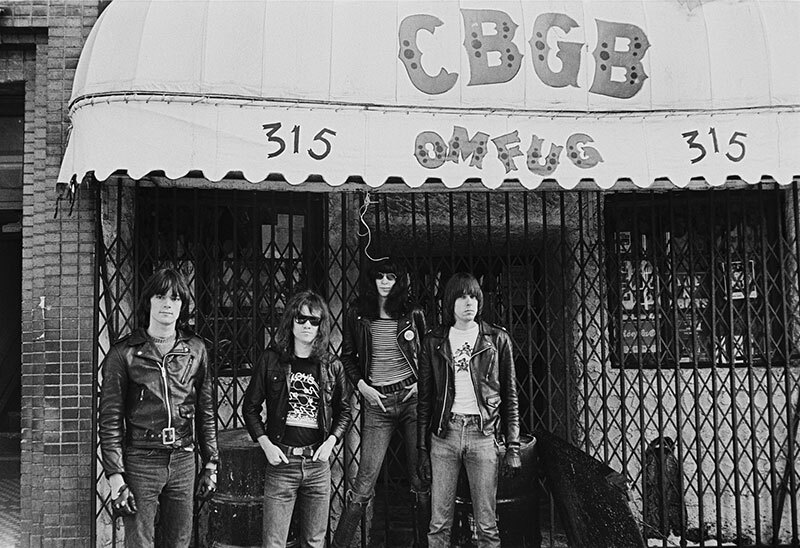 The Queens Economic Development Corporation has launched a radio ad campaign featuring the legendary punk band's 1977 hit "Rockaway Beach" (a song written by Dee Dee Ramone), to lure people back to a shorefront devastated by Hurricane Sandy. The area lost large stretches of its boardwalk and as many as 400 businesses, with many only now returning, said Rob MacKay, who runs the Queens Tourism Council. The new campaign features a video put together by a group of Queens high school students that can be seen on the Web and in radio spots. Click the logos below to read more at the Daily News and view video at NY1 online now. 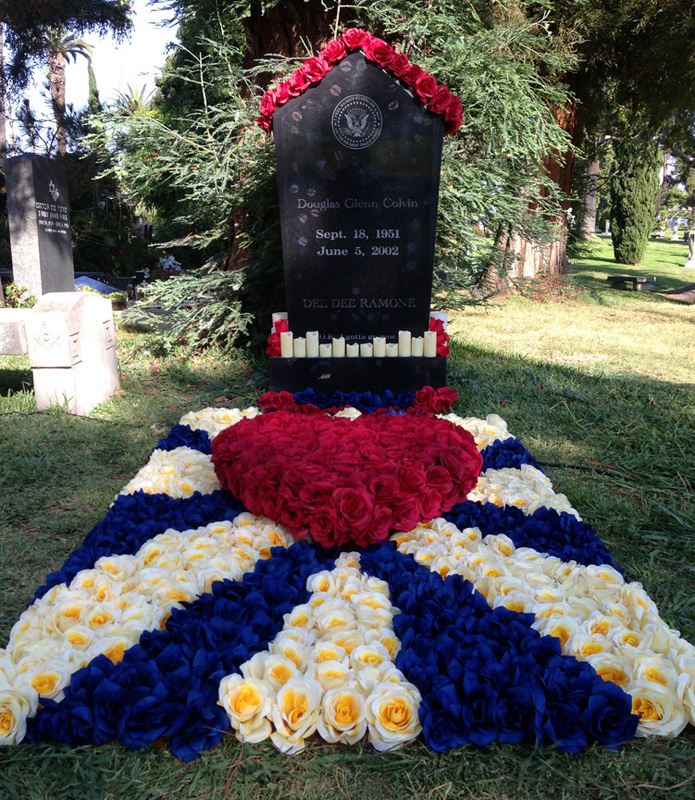 We are saddened by the recent loss of friend and longtime Ramones lighting director, artist Arturo Vega. Under the guidance, input and influence of the band members themselves, Vega designed the Ramones world famous eagle logo seal which appeared for the very first time on the back cover of the Ramones 1977 sophomore release “Leave Home”. The logo has remained an omnipresent icon in the band’s legacy ever since. In addition to lending his support and artistic talents, which included hand painting stage backdrops for live concerts, and hand silk screening T-shirts for the band in the early years, Vega even provided a home to Joey and Dee Dee for a period of time in his east village loft—conveniently located just a stone’s throw away from CBGB. In latter years Vega would encourage Dee Dee to pursue and explore visual art, even collaborating with him on a series of paintings. Arturo Vega proudly wore his Ramones residency on his sleeve on a consistent basis until the day he died. The marks he made on earth will remain relevant long after his passing. A vibrant and insightful self portrait of Dee Dee, painted shortly before his passing in June of 2002. © Dee Dee Ramone, LLC. All Rights Reserved. 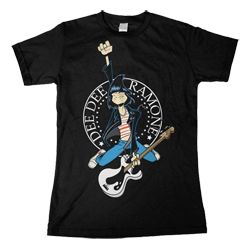 Dee Dee was best known as the bassist, songwriter, and one of the founding members of the legendary American punk rock band, the Ramones. His sincere love for the visual arts and his boundless imagination prompted him to create an ongoing series of paintings throughout his lifetime. These paintings are highly reflective of his personality through their rebellious, dynamic, eccentric, and comedic aesthetic. In addition to work by Dee Dee, Shepard Fairey will be releasing a print based off selected images provided by Dee Dee’s Estate. This print will be available for purchase, along with a print of Dee Dee’s Untitled (Self Portrait), 2002. As a way to further honor what Dee Dee contributed to others during his lifetime, a portion of proceeds from sales of the Untitled (Self Portrait) print will be donated to the Los Angeles Food Bank in Dee Dee’s honor. Frankenweenie, Disney's latest feature film from director Tim Burton, is in theaters now. 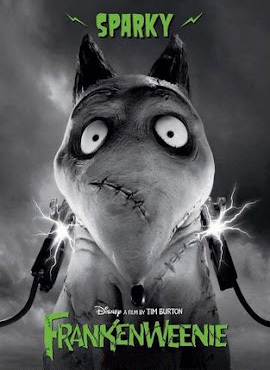 A "music inspired by" soundtrack was recently released, (entitled "Frankenweenie Unleashed"), featuring a cover version of the Ramones song "Pet Sematary." A promotional music video for the cover (performed by The Plain White Tees) features clips from the new movie and closes with a shot of the stop motion animated characters watching an on-screen dedication to The Ramones. Check out the Frankenweenie Music Video set to a cover of the Ramones song "Pet Sematary." Visit the official Frankenweenie movie website to watch the trailer and more. 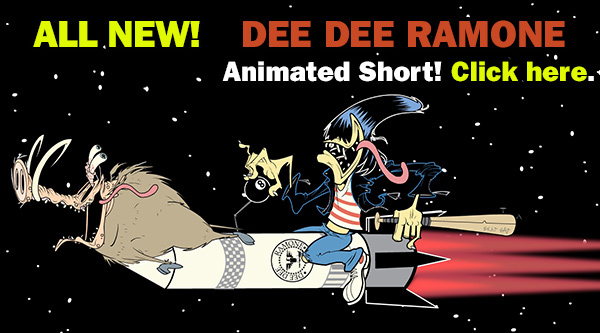 ALL-NEW DEE DEE RAMONE ANIMATED SHORT! This great new animated short features the many faces of Dee Dee Ramone and his wildly creative imagination! SEE: Dee Dee in 'Fink' form blast off on a 'trip to the moon' with his trusty warthog companion! SEE: Cameos by Dougie the Dachshund! SEE: Dee Dee transform into the Blue Dragon right before your very eyes—outside of the infamous Chelsea (horror) Hotel! SEE: Dee Dee face off with pinhead Moonies! and MORE all set to the tune of "The Crusher" as originally performed by alter ego of Dee Dee Ramone — 'Dee Dee King'! The fantastic new animated short celebrating the life and legacy of Dee Dee Ramone was Produced by John Cafiero (Osaka Popstar) on behalf of Dee Dee's Estate, with Dee Dee's wife and longtime collaborator in art and music: Barbara Ramone Zampini serving as Executive Producer. The piece showcases an incredible team with illustrations and direction by Sam Fout of Moon Toad Productions, and animation by Todd Cronin of Fishtoonz Animation, (collective credits include Cartoon Network, Lucasfilm, SNL, Warner Bros. and Disney among others). Enjoy cretins and...viva Dee Dee Ramone! Now fans of the Ramones have cause to celebrate as the very same T-shirts Dee Dee famously wore in the late 70’s and 1980’s become available for the first time ever in decades. Worn Free presents fantastic new replica editions - authentic in every respect, fully licensed, and created in conjunction with the Dee Dee Ramone Estate. Worn Free offers ultra-soft, high-quality replicas in the same styles and colors made famous by Dee Dee back in the day, plus your choice of alternate color-ways created for the new millennium. 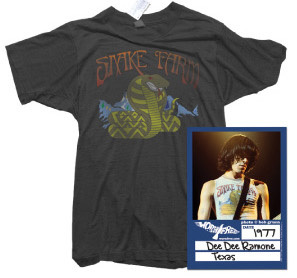 In addition to "Eat the Rich" (as worn by "Dee Dee King" in the 1980's),"Snake Farm" and "St Hilary Hustlers" (as seen in vintage Dee Dee Ramone photos from the 1970's), Worn Free have just added 3 new designs to celebrate the life and legacy of Dee Dee Ramone. 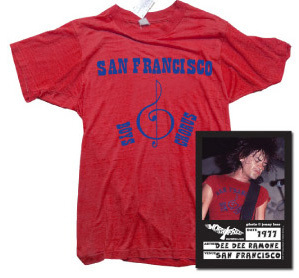 "San Francisco Boys Chorus", "Classical Composers" and the phenomenal— "I KILL MOONIES" tee seen on Dee Dee numerous times in concert with the Ramones! Check out the flyer below showcasing all 7 replica Dee Dee Ramone designs available now, and visit Worn Free to order your favorites. Artist Lucas Lasnier aka “Parbo” of Buenos Aires Argentina recently held an exhibition at the Tag and Juice gallery in Sao Paulo Brazil featuring a series of paintings he had originally created for Argentina’s Gabba Gabba Paint show. Works rendered in tribute to Dee Dee and a love for the Ramones were exhibited. 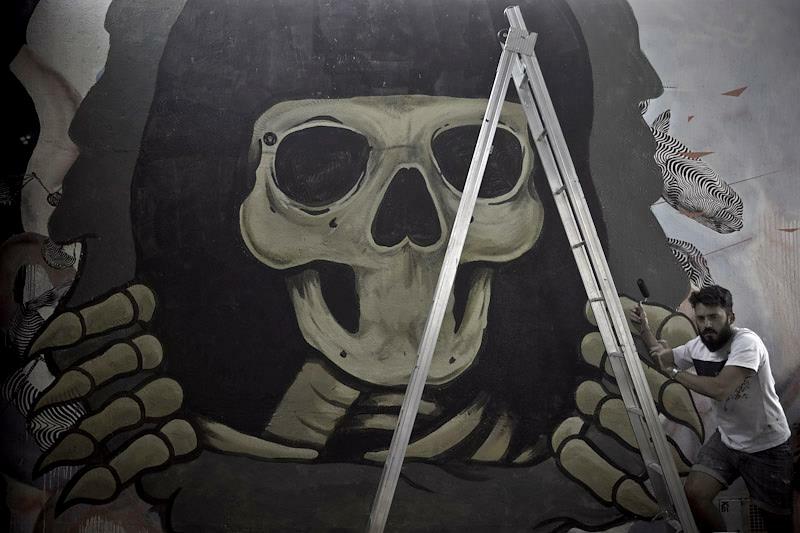 The exterior wall of the gallery in Sao Paulo showcased a larger than life mural-sized rendering of Parbo’s infamous “Ripping Dee Dee” skull design! Click Here to check out a time-lapse video of Parbo painting the “Ripping Dee Dee” mural start to finish— from scratch! Photos of the making of the mural are available here. Click here for photos from the show opening at the gallery in Brazil. 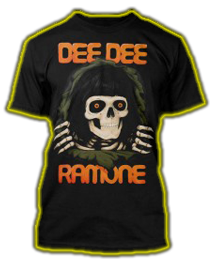 The “Ripping Dee Dee” skull design comes straight off the canvas of Parbo’s “Gabba Gabba Paint” Show and onto a killer T-Shirt (available in both men's and women's styles), plus button and sticker on sale now at the Dee Dee Ramone Online Store. RAMONES IN TIME OUT NY’S 100 BEST NYC SONGS! Time Out New York Magazine recently ran a feature article on their picks for the “Greatest tunes about Gotham”. 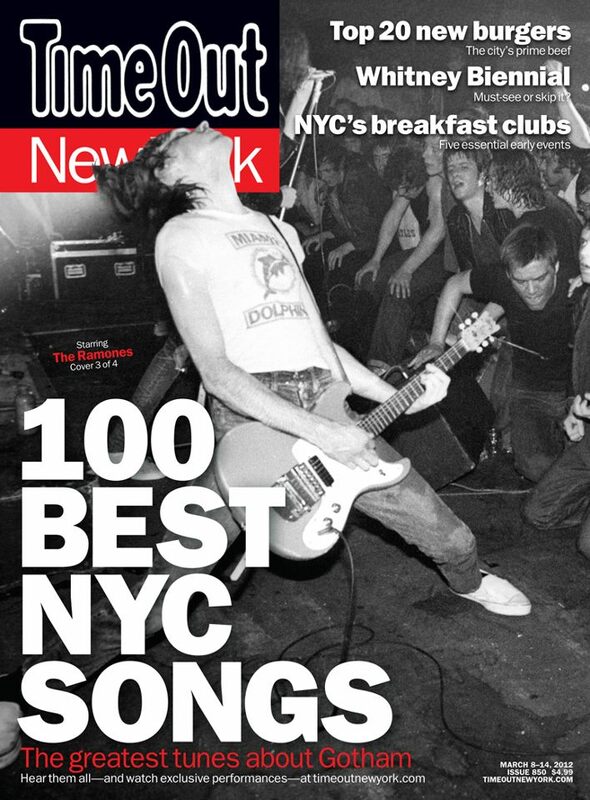 Their “100 Best NYC Songs” issue offers 4 different covers, each profiling an iconic NYC artist. The Beastie Boys, Joni Mitchell, Run DMC and THE RAMONES were each honored with their own individual cover. 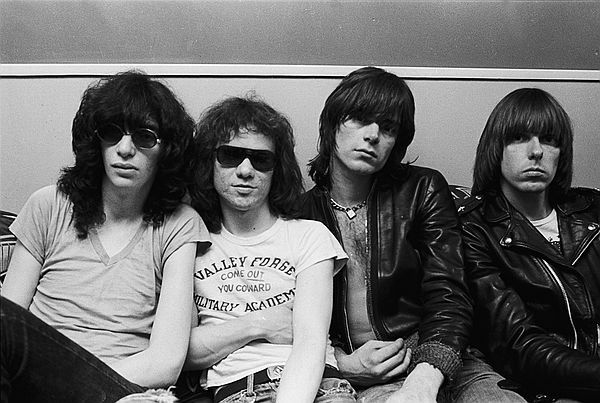 The Ramones entered the Top 100 list at #20 with “Rockaway Beach”, and a second entry for “53rd & 3rd” at #67. 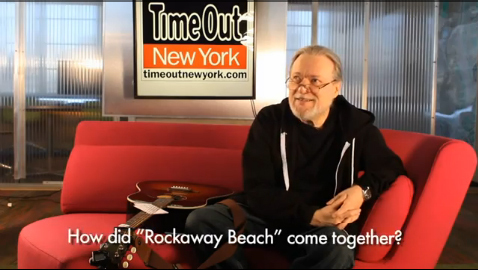 Time Out NY also invited the only living original member of the Ramones, drummer Tommy Ramone, to stop by for a video interview in connection with the feature story. "He loved to get a tan," Tommy says of Dee Dee Ramone, who wrote the punk-rock summer anthem "Rockaway Beach." Tommy also provides personal insight on the songs of NYC and more, including an impromptu acoustic performance of “Rockaway Beach” at the Time Out NY offices. Click Here to watch online now. Legendary punk-rock bassist Dee Dee Ramone defined "punk" and was the driving creative force of the Ramones. For the first time ever in his history-making legacy, Dee Dee has been rendered as a bobblehead figure, or as Funko calls them, Wacky Wobblers. These stylized six-inch-tall figures come decked in Dee Dee's traditional Ramones regalia—leather jacket, ripped jeans, and armed with his weapon of choice, (bass guitar) as used on stage while changing the face of rock 'n' roll. Click here for a larger view. Cretins can pick up the Dee Dee Wobbler at one of the lowest prices you’ll find anywhere—while supplies last—at the Official Dee Dee Ramone Online Store. Dee Dee is joined by fellow rock legends Elvis Presley and Jimi Hendrix, Marvel and DC Superheroes: Batman, Superman, Spiderman & Captain America, Star Wars’ Darth Vader, Universal Monsters, and countless other pop culture icons in the Funko Wobbler line. This amazing life-like rendering of Dee Dee follows Funko’s recent release of the stylized Dee Dee Ramone POP! Vinyl Figures — also available. 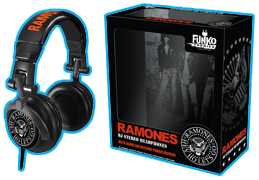 There’s no stoppin’ the Cretins from hoppin' with the Ramones DJ Headphones by Funko! Equipped with a standard 3.5mm audio jack and 40mm drivers, these unique high-quality headphones are decked-out with the Ramones logo and emblazoned with the battle-chant “Hey-Ho-Lets-Go!”. If the volume doesn’t already give it away, these headphones will. Show your Ramoniac pride with these great DJ headphones out now. 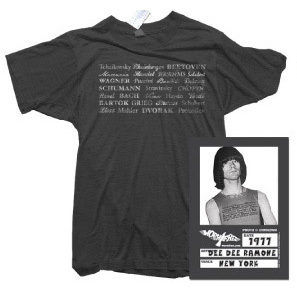 For all this and lots more, visit the Official Dee Dee Ramone Online Store now. We’re proud to unveil the patron saint of punk rock: “Saint Dee Dee”. This magnificent new painting by LA artist Vicki Berndt of the immortal “Saint Dee Dee” will watch over you and protect from mediocrity in music and art. Saint Dee Dee's robe bears the ceremonial words "One Two Three Four", (appropriately written in latin), his sacred heart wears a crown, (for Dee Dee's pseudonym "Dee Dee King"), and bleeds onto the stones clutched in his hand to form the word "Chinese" (in traditional Chinese lettering), rendering them sacramental "Chinese Rocks". Berndt is well known for her “Big-Eye” 70’s stylized paintings, and “Berndt Offerings” of pop culture icons. In an exclusive to the new Dee Dee Ramone Online Store, we’ve teamed with Berndt Offerings to bring you a line of very special Ltd. Ed. hand-crafted items featuring a rich reproduction of the original painting, direct from the artist herself! This beautiful, long lasting glass candle is approximately 8 inches high featuring glossy high-quality, full color art. 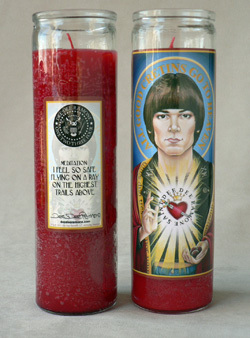 The candle includes a small "novena" prayer saying on the back which reads..."I feel so safe flying on a ray on the highest trails above", (quoted just as it reads on Dee Dee's headstone at the Hollywood Forever Cemetery in LA, CA), with Dee Dee's facsimile signature directly beneath his quote. 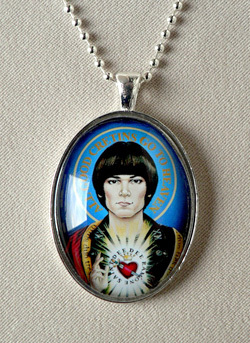 This beautiful rosary will help you to maintain and strengthen your daily spiritual relationship with Saint Dee Dee Ramone. The beaded chain is approximately 26 inches long. The cross and frame that holds the artwork are each 1.5 inches high. The entire rosary is made from silver toned metal and beads. This beautiful Pendant will proclaim your devotion to Saint Dee Dee. 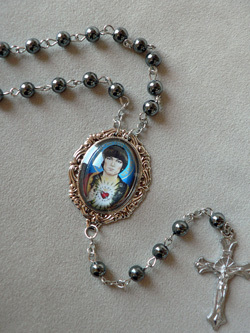 The frame is 2 inches high and comes with a 24-inch ball chain. The pendant is made from silver toned metal with a glass bubble protecting and magnifying the artwork. Each piece is affordably priced, hand-made and overseen by the artist personally. 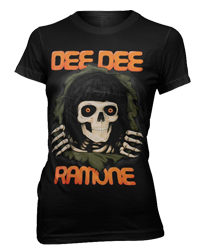 Available now— exclusively at the Dee Dee Ramone Online Store! 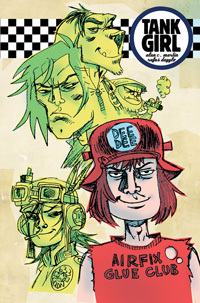 DEE DEE RAMONE JOINS TEAM TANK GIRL! 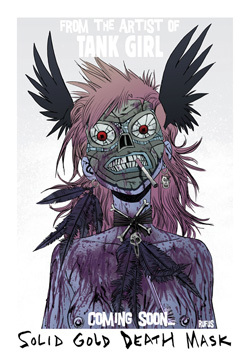 Tank Girl was co-created by writer Alan Martin and illustrator Jamie Hewlett (Hewlett is also co-creator of the Gorillaz). Fittingly, the strip drew, (and continues to draw), stylistic influences from punk visual art; so pulling Dee Dee Ramone through a vortex and into its post-punk apocalyptic world was a natural progression. 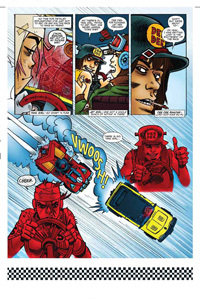 One that was instigated by present day Tank Girl artist and co-conspirer, Rufus Dayglo. 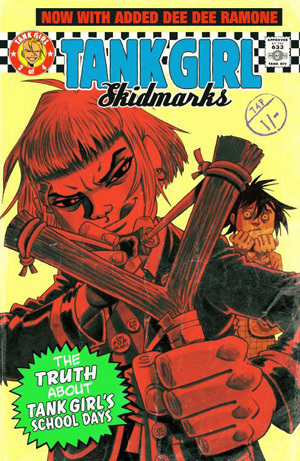 The Tank Girl Skidmarks series, (written by Martin and illustrated by Dayglo), first appeared in the Judge Dredd Megazine in September 2008. Printed in black and white (and blue!)... it ran in 12 episodes in the monthly British comic magazine over the course of a year. 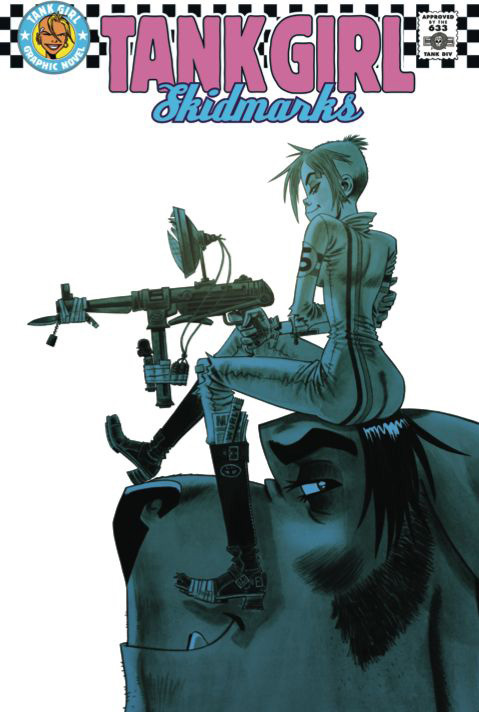 In 2009 it was collected into a 4 issue comic book mini-series in the US by Titan Books, (3 episodes per issue), and most recently the Tank Girl: Skidmarks Trade Paper Back collection. Splash page where Dee Dee first appears skating the pool, on his Dogtown Dee Dee board, with Dee Dee’s wife Barbara, and her friend Trina, depicted in the background at right! Click the art above for a larger image. Far Right: (R-L) Barbara Ramone Zampini and friend Trina at the 2008 Johnny Ramone Tribute. Photo by Paul Redmond. Unused production art of Dee Dee from Skidmarks, Courtesy of Rufus Daylgo. Click for larger view. 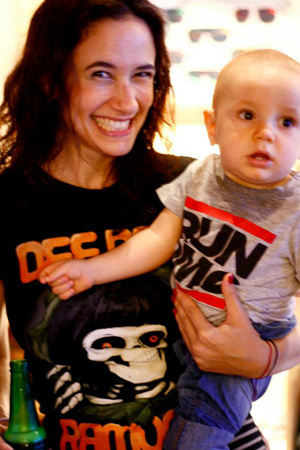 “I’ve been a Ramones fan since I could yell, 1,2,3,4. That seemed to be the best job in the world. Being in this incredibly cool band, and getting to yell…. 1,2,3,4. 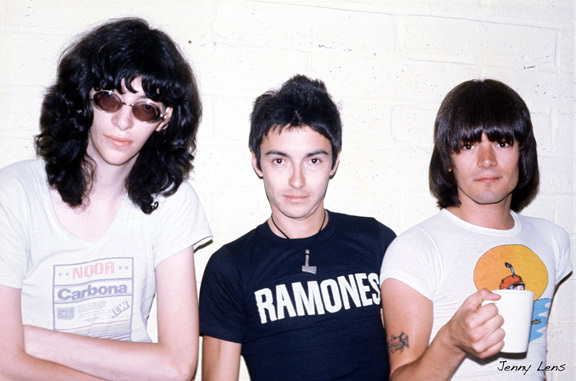 The Ramones have always been my first love, and Dee Dee my favourite. When we were about to start work on TANK GIRL – SKIDMARKS all I knew was it was going to be a race story… like Wacky Racers meets Cannonball Run head on with more collateral damage. When I suggested it to Alan, the writer for Tank Girl, he was excited, and found it funny! He’s a massive Ramones fan too. 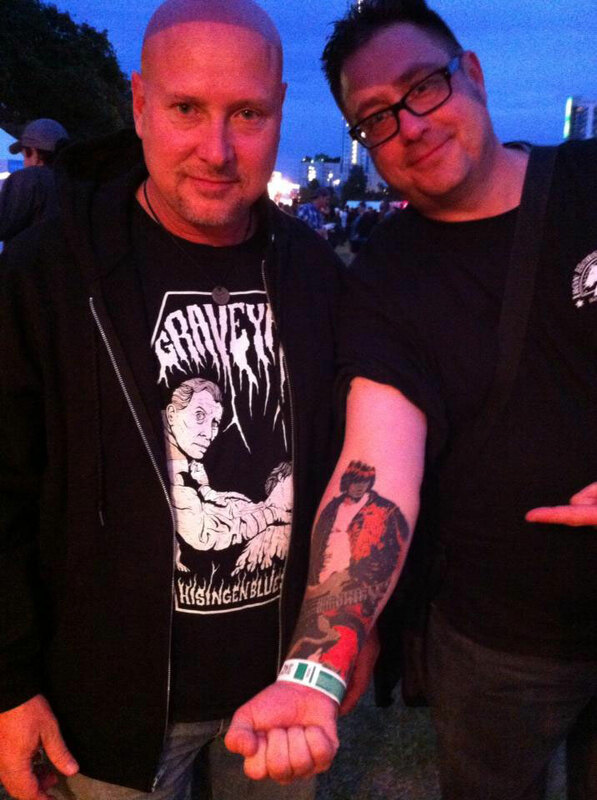 We were both really into the idea…of both doing a tribute, and making our favourite Ramone a comic book character. I thought it’d be fitting…he was just a comic book boy after all, and we both loved UFOs and war comics. I’d also been lucky enough to sing ‘Blitzkrieg Bop’ and ‘Born to Lose’ on stage at the Garage venue in London with Dee Dee and his wife Barbara’s band years ago, so this was my belated thank you to them too! I had on my ‘Gabba Gabba Hey’ jacket and Dee Dee recognized me. I was right up the front, and he pulled me onto the stage. It was a childhood dream come true…yelling 1,2,3,4!!! So what’s next for the artist whose pen name could light up Poly Styrene? Until then, check out Rufus’ work with Alan Martin on six different series’ of Tank Girl: “The Gifting”, “Visions of Booga”, “Skidmarks” (featuring Dee Dee Ramone), “The Royal Escape”, “We Hate Tank Girl”, and “Bad Wind Rising” available now wherever fine comics are sold. 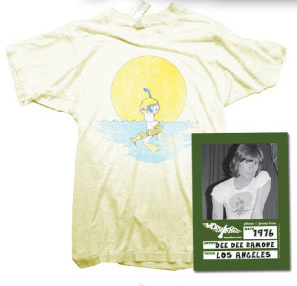 In fact, in honor of Dee Dee’s Birthday, and the launch of DeeDeeRamone.com, we’re offering a very special online exclusive! 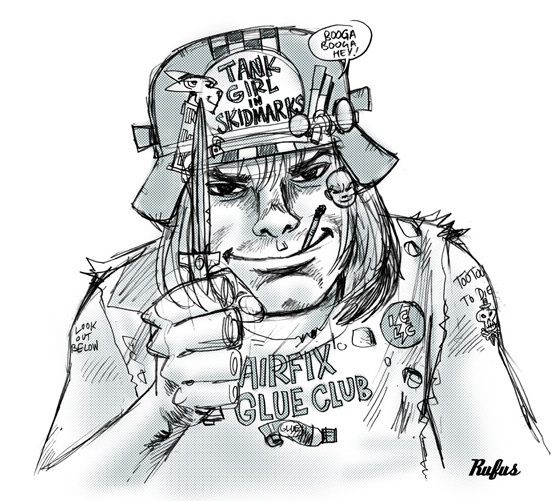 The first 50 people to order the Tank Girl Skidmarks Trade Paperback collection at the all-new, official Dee Dee Ramone Online Store receive an autographed bookplate signed by Tank Girl artist Rufus Dayglo! Some include a hand-drawn sketch too! 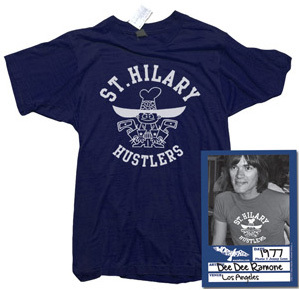 Available now, and only while supplies last—exclusively from DeeDeeRamone.com. or get all 4 together in the Skidmarks Trade Paperback Collection. 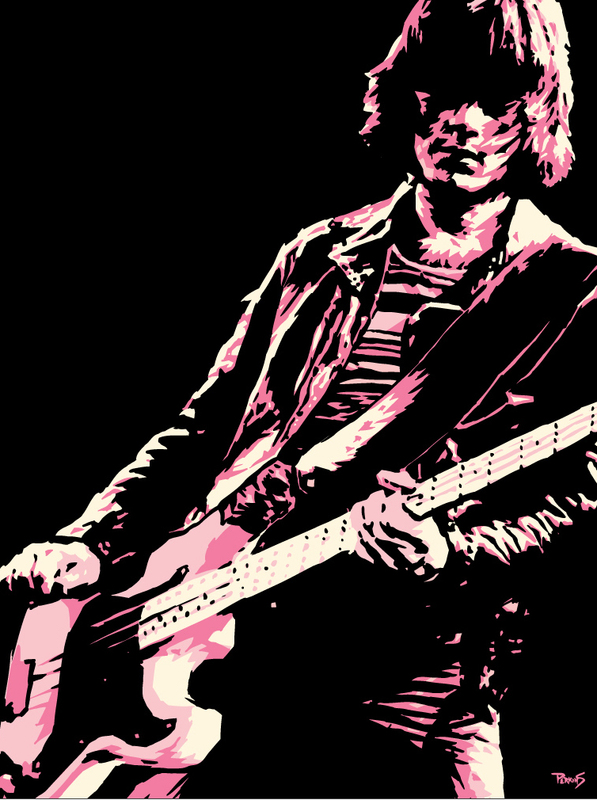 In the tradition of celebrating the life, legacy and diversity of Dee Dee Ramone through all art forms, we proudly introduce a variety of new artistic interpretations of the one and only—Dee Dee! Lucas Lasnier aka Parbo of Buenos Aires brings us a “Ripping Dee Dee” skull straight off of the canvas seen in Parbo’s “Gabba Gabba Paint” Show imported in all the way from Argentina for this killer new T-Shirt, pick up a button or sticker too! An iconic black and white portrait, (hand-picked by Dee Dee’s wife Barbara Ramone Zampini personally! ), is featured on a classic vintage photo T-shirt available now. Photographer Ed Perlstein shot the iconic image as Johnny, Joey, Dee Dee & Tommy blew the roof off of The Old Waldorf, in San Francisco on January 31, 1978! 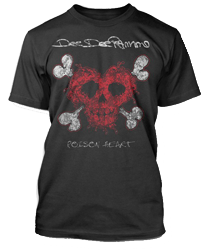 All of these great new Dee Dee tees and more, including the distressed “Poison Heart” tee, are available in both men’s and women’s sizes too. 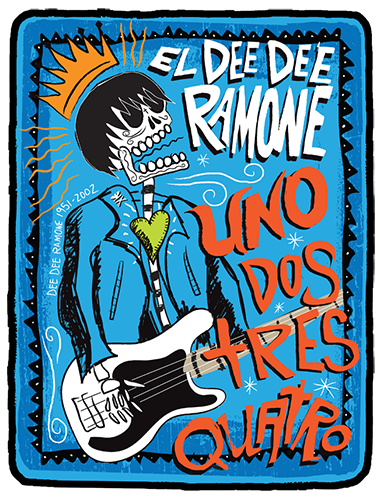 On Sept. 18, 2010 the art of Dee Dee Ramone was celebrated at the La Luz De Jesus Art Gallery in Los Angeles, CA. In honor of the event, Dee Dee’s wife and artistic collaborator in both music and art, Barbara Ramone Zampini, painted a special portrait of Dee Dee enjoying the moment—with Jesus himself! Check out the pic above bookended by shots of Barbara taken at the after party, posing with a phenomenal Poison Heart tattoo, courtesy of Daniel Richmond’s arm. To commemorate the event at La Luz De Jesus an 18” x 24” Ltd. Ed. screen-printed event poster, featuring one of Dee Dee’s quintessential self-portraits: “Dee Dee Ramone: The Blue Dragon” was screened in an edition of just 150 signed and #’d pieces! The last few remaining prints from the edition are available now exclusively in the Dee Dee Ramone Online Store, while supplies last, or you can pick up a Blue Dragon button or sticker featuring Dee Dee’s self portrait at just a fraction of the price! An eclectic mix of Dee Dee fans, art aficionados and Ramones enthusiasts gathered at La Luz to celebrate, including actor/comedian Russell Brand and many more. Check out the interview with Russell below, peep out some of Dee Dee’s paintings hanging in the background, and look for a full recap of the Dee Dee Ramone Birthday Memorial Art Show, with photos, video and much more, coming soon to this site! 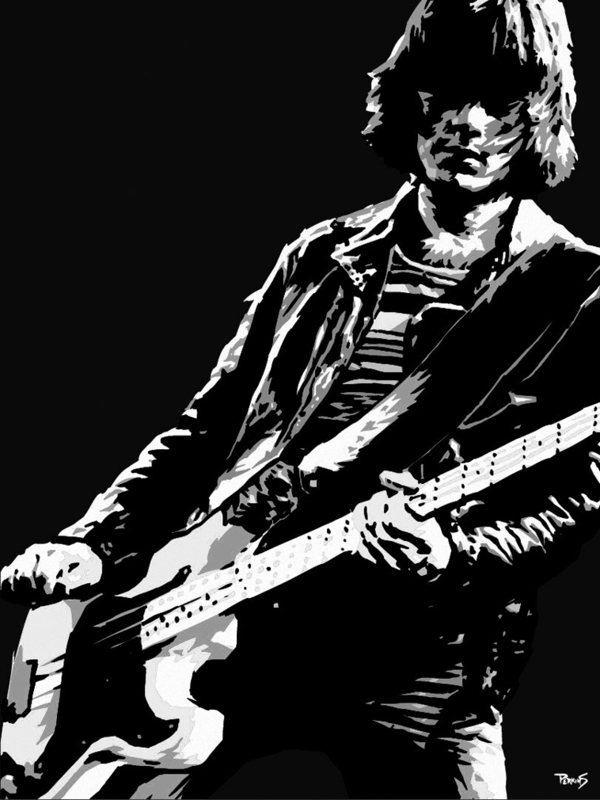 Legendary punk-rock bassist Dee Dee Ramone defined "punk" and was the driving creative force of the Ramones. 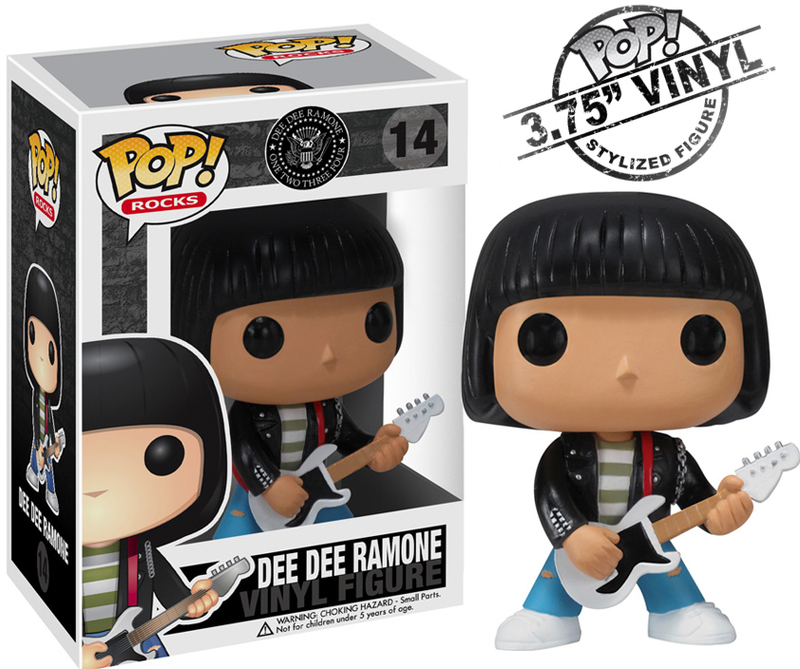 For the first time ever in his history making legacy, Dee Dee has been rendered as a vinyl figure—joining the ranks of Elvis Presley, Jimi Hendrix, Kiss, Ozzy, and more, in Funko’s POP! Rocks series. 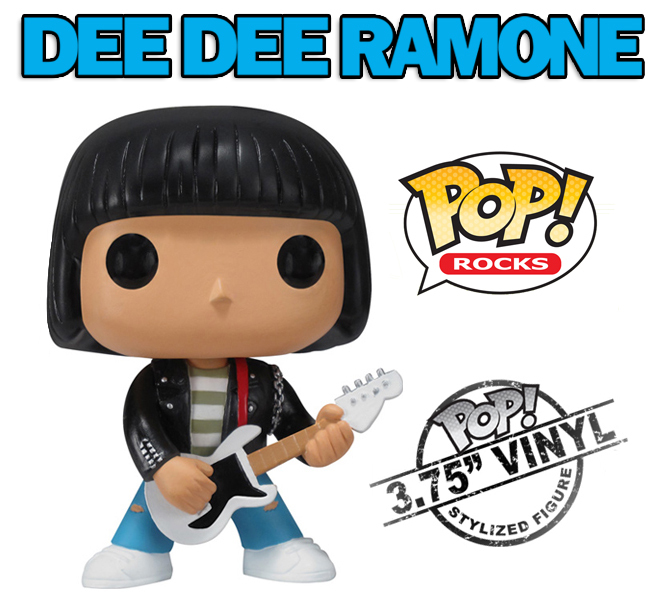 Available worldwide these stylized 3.75-inch tall vinyl figures come decked in traditional Ramones leather jacket, detailed with Dee Dee’s enigmatic glare, and armed with his weapon of choice, (bass guitar) as used on stage while changing the face of rock ‘n’ roll. 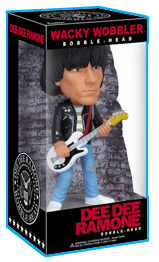 Order now at the Dee Dee Ramone online store before these historic figures are sold out! The Ramones -- seen here with their original lineup of Joey, Tommy, Dee Dee and Johnny Ramone -- will receive a Grammy lifetime achievement award in 2011. Of the four original Ramones, only Tommy is still alive. Look for a full recap of the Grammy Award ceremony coming soon. SANTA MONICA -- Julie Andrews, The Kingston Trio, Dolly Parton and the Ramones were among the recipients named today of the Recording Academy's lifetime achievement awards. Other honorees are jazz drummer and bandleader Roy Haynes, the Juilliard String Quartet and gospel singer/composer George Beverly Shea. The artists will be honored during an invitation-only ceremony Feb. 12, the night before the 53rd annual Grammy Awards. Also during the ceremony, Trustees Awards will be presented to Al Bell, former vice president of Stax Records and one-time president of Motown Records; classical music producer and former Mercury Records vice president Wilma Cozart Fine, who will be honored posthumously; and Bruce Lundvall, former president of Elektra Records and past head of Manhattan Records at EMI. Technical Grammy Awards will be presented to Roger Linn, designer of pioneering drum machines and founder of the company that designed guitar pedals for special musical effects; and Waves Audio, which pioneered the use of software applications with the invention of the Q10 Paragraphic equalizer. "It is a great honor to recognize and celebrate such a distinguished and dynamic group of honorees who have been the creators of such timeless art," Recording Academy President/CEO Neil Portnow said. "These influential performers and brilliant innovators have been of great inspiration to our culture and industry. Their legendary work has left a lasting impression and will continue to influence generations to come"
LOOK FOR A FULL RECAP OF THE 2010 ART SHOW WITH PHOTOS, VIDEO AND MORE COMING SOON. 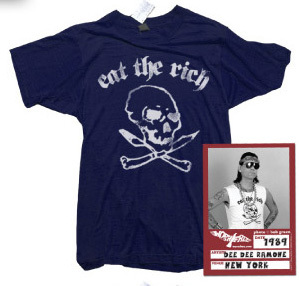 CURRENTLY AVAILABLE AT THE DEE DEE RAMONE ONLINE STORE. Dee Dee Ramone will forever be an enigmatic punk rock icon. While most are familiar with his musical legacy as a founding member and songwriter in the world famous Ramones, many are less aware of his talent for art and painting. Like Dee Dee, the work is rebellious, dynamic, eccentric and comedic. An exhibition of over thirty original pieces have been assembled, many of which will be displayed for the very first time at this extraordinary event sanctioned by Dee Dee’s Estate to honor the rock legend. Rare, vintage images of Dee Dee have been cherry-picked from the critically acclaimed, Jenny Lens Photo Archive and will be available for purchase as oversized, signed, numbered, museum quality prints. Hailed as the most published first-wave west coast punk photographer in the history of the movement, Jenny will share her experiences with the Ramones at the opening night reception, specifically citing Dee Dee as the reason she picked up a camera initiating her prolific body of work from 1976-1980. A special Limited Edition, 18” x 24” screen-printed event poster featuring one of Dee Dee’s quintessential self-portraits: “Dee Dee Ramone: The Blue Dragon” will be released starting at 7pm on September 18th. 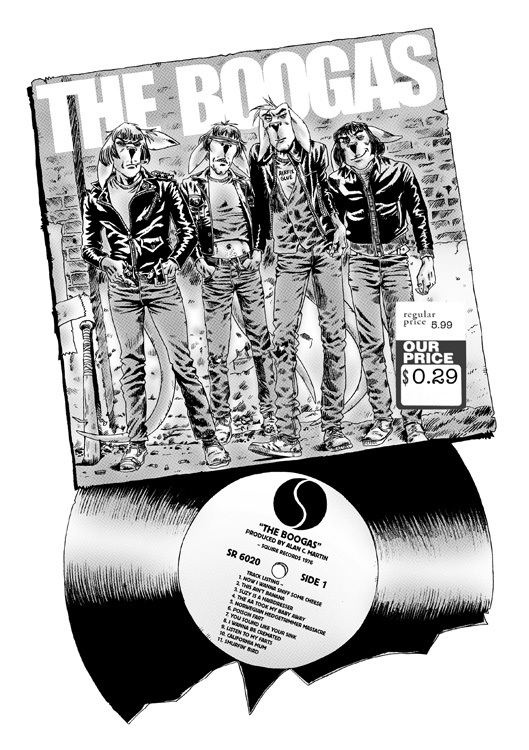 The print, limited to an edition of 150 pcs, also incorporates the iconic Ramones Eagle logo, appearing courtesy of Ramones Productions Inc. in support of the event. Admission to the exhibition is free and open to the general public. A portion of net proceeds from the sale of the Ltd Ed. screen-printed event poster and archival photos will benefit the LA Regional Food bank via donation in Dee Dee’s name. Barbara Ramone-Zampini, wife of the late seminal punk legend and longtime collaborator in his solo career in both music and art explains: "It’s wonderful to have the opportunity to share these rare works with fans to fully appreciate in person. Dee Dee’s spirit truly lives in these paintings and when you experience them up close, its very obvious. He always talked about helping children & gave to the homeless all the time. Dee Dee was very generous, more than most will ever know. I think he'd be really proud that he continues to help people today through his art."